Beautiful LIME-GREEN & BLACK/WHITE CORDUROY JUMPER DRESS SET features BLACK/WHITE STRIPE KNIT TURTLENECK TOP with long sleeves. LIME-GREEN CORDUROY JUMPER features RIC-RAC TRIM at the YOKE NECKLINE and FUZZY WHITE Black-Witch-Hat-Wearing-Kitten-Kitty-Cat APPLIQUE plus BLACK/WHITE STRIPE RUFFLE HEM and easy back zip closure. Machine washable. Imported. 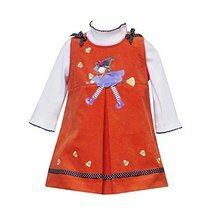 Top of cotton/polyester - Jumper of 100% cotton - Exclusive of trim/decoration. Matching/Coordinating sister styles available in sizes 3M-6X, search for style(s): RRE-38690. More baby & girl party dresses available, search for: " rre-girl-party-dress "
LIME-GREEN & BLACK/WHITE CORDUROY JUMPER DRESS SET features BLACK/WHITE STRIPE KNIT TURTLENECK TOP with long sleeves. 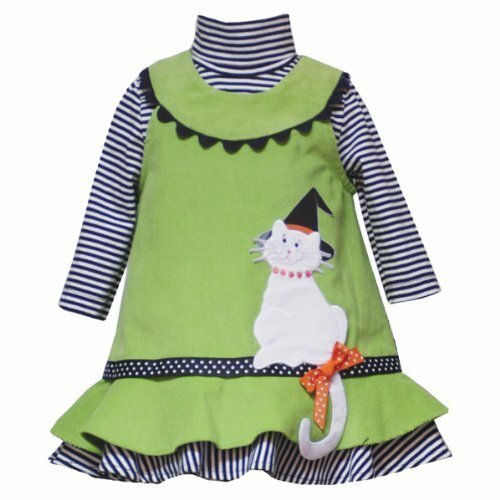 LIME-GREEN CORDUROY JUMPER features RIC-RAC TRIM at the YOKE NECKLINE and FUZZY WHITE Black-Witch-Hat-Wearing-Kitten-Kitty-Cat APPLIQUE plus BLACK/WHITE STRIPE RUFFLE HEM and easy back zip closure. 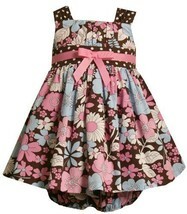 Matching/Coordinating sister styles available in sizes 3M-6X, search for style(s): RRE-38690.